Chris ‘Brolga’ Barns, was extraordinarily tall even as a ten year old, and sometimes teased for it at school. He knew early on he wanted to make a living working with animals. When he was 17, he landed a job at a new zoo in Broome, where he was to be ‘the bird guy’. One lonely night, while in the house provided fot the keepers by the zoo, Brolga heard coughing from one of the bedrooms. The source was an orphaned joey named Josie. Just like a baby, she needed four-hourly feeds, and help going to the toilet. The experience of helping Josie began Brolga’s unique connection to kangaroos. 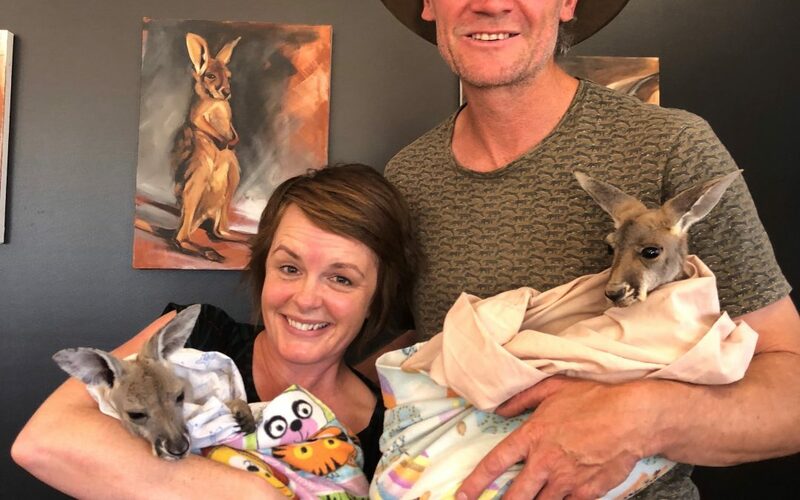 After a time, he began to rescue joeys left alive in the pouch of mother kangaroos hit by cars. Word spread about his passion for orphaned joeys, and he started an education centre in an old double-decker bus. In 2013 the BBC made a documentary about Brolga, Kangaroo Dundee, which became a worldwide hit. Brolga and his wife Tahnee now run a hospital and rescue centre outside Alice Springs.